Family law proceedings are sometimes punctuated with unexpected events that may at times hinder or even halt proceedings. These events can occur as a result of misuse of role, and applies to all parties to proceedings including the legal representatives and the judicial officers. We have previously discussed “How to Remove a Judge or/and an ICL from Proceedings“, and now we will look at how the Courts can remove a litigant from proceedings and under what circumstances. Litigation is not a process that is embraced by individuals involved. It can be extremely stressful, inconvenient, expensive, lengthy, and emotionally challenging. However there are some individuals which pursue cases relentlessly and with improper purpose causing issues within the court system. These people are called Vexatious Litigants. 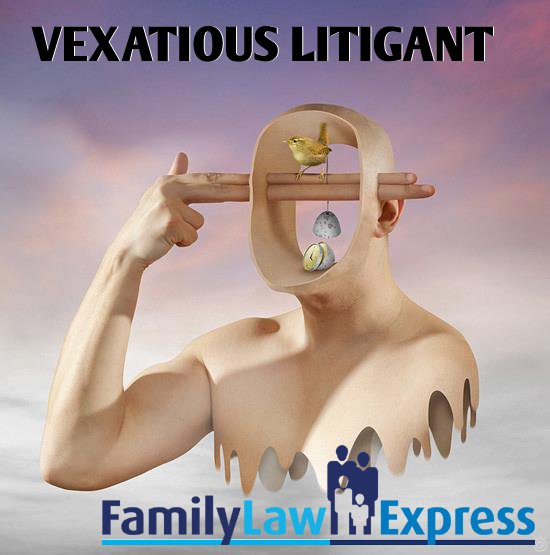 A Vexatious Litigant is anyone who repeatedly takes legal action for wrongful purposes or without reasonable grounds and become subject to Vexatious Proceedings1 under the Vexatious Proceedings Act 2008 (NSW)2. 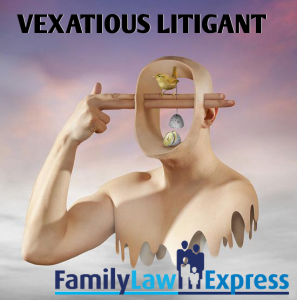 A vexatious litigant is known to create a proceeding which “intended to harass or annoy, cause delay or … taken for some other ulterior purpose or which lack reasonable grounds” 4. Justice Adrian Roden in Attorney General v Wentworth (1988)5 sets out three tests for establishing a vexatious proceeding. ” 1. Proceedings are vexatious if they are instituted with the intention of annoying or embarrassing the person against whom they are brought. The Vexatious proceeding Act (2008)7 is criticized by Nikolas Kirby’s in his article “When rights cause injustice: a critique of the Vexatious Proceedings Act 2008 (NSW)”8 2009 163-181.]. Kirby discusses how the Act (2008)9(which replaced the previous Supreme Court Act (1970)10) has 4 main flaws11. Firstly, it broadens the term vexatious litigant beyond the established test previously stated in s84 of the Supreme Court Act 1970 (NSW)12. Secondly, the scope of a vexatious proceedings order is expanded, preventing trials in both tribunals and courts. Thirdly, the standards to apply for an order are lowered allowing a larger range of parties to apply. Lastly, it provides more flexibility within the courts in both the constructing and declining of orders 13. In order to fall within s84 of The Supreme Court Act (1970)14 individuals must have a lack of reasonable ground for the proceeding, and the litigant must have ‘habitually and persistently’15164 ALR 378 at -.] instituted the proceeding16. Here there is a high threshold and standard for an individual to be successfully claimed as a vexatious litigant. The criteria states a high merit must be met and merely ‘frequent’17 proceedings will not suffice18. However s8(1)(a) of the Vexatious proceeding Act (2008)19 contradicts this in stating that an individual is a vexatious litigant if they frequently conducted proceedings. ‘Frequently’ here means,repetitively, short interludes, or numerously. However, this term needs to be observed relatively and within the context of the situation20. Thus, the tests established in Attorney General v Wentworth (1988)21 become paramount. The first two bases of a vexatious litigant established in Attorney General v Wentworth (1988)22 are subjective to character allowing for a contextual and relative association, the third is objective allowing for three alternative and a more contextual well rounded bases to this definition23. S84 of the Act (2008)24, allows for alternative action for those individuals who are or may be deemed as vexatious, an example being alternative dispute resolution25. These alternatives allow for a speedier and less expensive route for all parties involved. Through the established definitions of a vexatious litigant there are some risks of inequality and injustice. There are individuals who may be excluded from the court system due to these definitions because of social disadvantages, established from social inequalities, rather than on the value of their claim. These individuals may be those who are self-represented due to the financial burden of the justice system, other individuals being those who suffer from a disability or have a limited understanding of English, and thus slowing down the proceeding26. In Family Law proceedings, the impact of a vexatious litigant can be significant. The impact on the individual who becomes a victim of their conduct can be extremely harmful. This type of process results in the party without the financial means and resources to sustain the lengthened court proceedings, to opt out of matter presented by the vexatious litigant28. Family Law litigation has the highest rate of vexatious litigants than any other jurisdiction in Australia29. The Family law court has three times the amount of vexatious litigants than any other superior court combined30. However a structural issue arises due to the closed court rules of Family Law, restricting NSW courts from taking previous Family Court litigation into account31.Wilmoth and Wilmoth (1981)32 is an example of the stress that a vexatious litigant can place on the opposition and the children involved. The Family Law Act (1975)33includes regulations against vexatious litigants to aid in preventing this abuse of justice and the subsequent stress placed on these individuals. An example of this being s118 of the Act34, stating that the courts can dismiss proceedings ormake cost orders if they deem a case is vexatious. S118 of the Act (1975)35 gives the Family Court the discretion and control once the limit has been established. In the Family Courts, history of conduct or any aspects of repetition do not need to be taken into account; merely the threshold test is applied36.